INDIANAPOLIS (August 12, 2013) — Klipsch, a leading global speaker manufacturer, announces today the launch of the new Image® ONE Bluetooth® White. Catering to both wireless and on-ear enthusiasts, this headphone maintains the same high-quality sound signature and comfort as the original Image ONE Bluetooth while offering an alternative finish to accommodate listeners’ personal style. Combining high-performance Klipsch sound with the convenience of wireless listening, the Image ONE Bluetooth White utilizes Hi-Fi Bluetooth (A2DP) audio quality and aptX Codec for lossless streaming so users experience high-performance, uninterrupted listening. The headphone’s wireless capabilities are enabled via a built-in rechargeable battery; with wired connection still possible via the included direct connect audio cable. Large, easily-accessible controls are located on the right ear cup for controlling playlists and phone calls. Extensive research resulted in the ideal ergonomic placement of buttons so users’ hands naturally fall onto the controls. 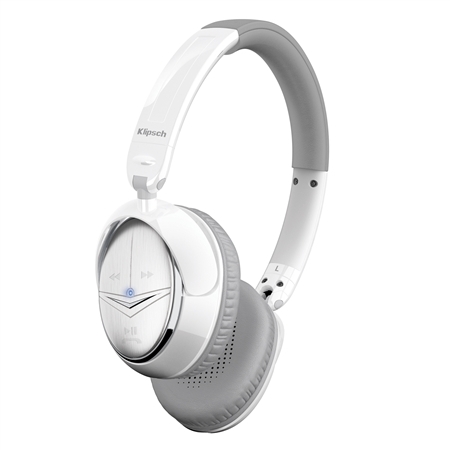 Showcasing a sleek white finish with brushed aluminum and gray leather accents, the Image ONE Bluetooth White offers listeners comfortable ear cups featuring leather-wrapped memory foam. Enabling hours of listening pleasure and superior passive noise-isolation, the headphone blocks out ambient noise and provides enhanced bass. Its compact, collapsible design aids with storage and travel, as the ear cups can be folded flat into the headband. In addition to offering 10 hours of continuous talk and listening time from a paired Bluetooth device, roam up to 33 feet away and remain connected to your music and calls. Now available in a black or white finish, each Image ONE Bluetooth is compatible with any Bluetooth-enabled device. Included with purchase are a compact travel case, direct connect audio cable, micro USB charging cable, ¼” adapter, airline adapter and two-year warranty. The Image ONE Bluetooth White retails for $249.99 (U.S. MSRP) and is now available at authorized retailers and http://www.klipsch.com.